I successfully made it to Richfield, UT today. It ended up being a 10-hour drive and about 550 miles. I thought I had done about 100 more miles than that, but then realized that I had just screwed up my math. The route I had planned for tomorrow was now totally unrealistic. I knew it was roundabout, but now it just wasn't feasible. Some quick calculations, however, put me back on track to end up in Boise tomorrow. Today's drive was largely uneventful. I was amazed while driving through the Navajo Reservation that traffic was still pretty heavy even being on roads that are pretty much in the middle of nowhere. There are Indian settlements spread out all over the place. There are also lots of new settlements being built as well. There appears to be nothing around for miles and all of a sudden there's a brand new high school complex or health clinic. Outside of that, traffic has been incredibly light on the 2-lane roads. I'm running at the speed limit unless I meet up with some douchebag in a rented RV. Weather has been great. Scenery has been incredible. 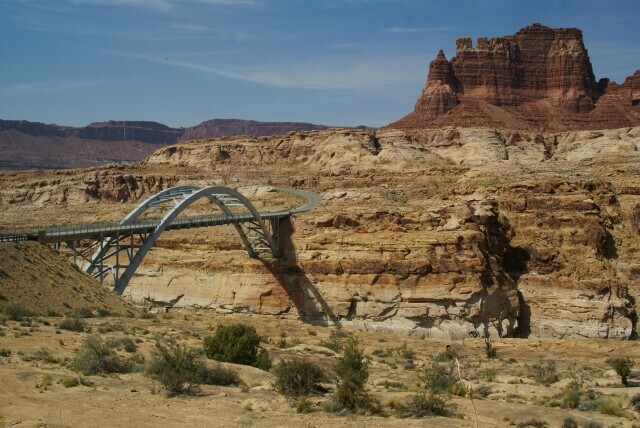 Utah state highways 95 and 24 are some of the most scenic drives in the country. Here, let me prove it to you. Colorado River crossing just above Hite Marina on Lake Powell.